The Tvan Tanami proves to be one of the best-designed units and scores particularly well for ease of set-up and need for minimal site area. The Tvan was the only hard-roof camper in the torture test and was judged the best for short overnight stops, with no need to open the tent section at all. The outer section of the tailgate doubles as an easily packed firewood rack and becomes the tent floor when hinged down to ground level. This hard floor makes site preparation unnecessary and height-adjustable legs compensate for uneven ground. The inner lid opens upwards and, normally, the tent section is then unfolded from the under-side of the lid. However, for overnight stops it’s possible to leave the tent stowed and either shut the lid for privacy, or zip in a mesh flyscreen to keep out the creepy-crawlies. A clear roof hatch provides ventilation over the bed, even with the rear lid shut. For tented camps the canvas section unrolls from the lift-up rear door and is reasonably easy for a couple to erect and pack away. The tent emerges from under the lid and is clipped to the hard floor section, which makes a sheltered dining area or space for kids to sleep. Zip-up doors on both sides of the tent provide flow-through ventilation. Long-stay mode involves fitting the standard awning and end wall. If you really want to stake a land claim you can buy optional annexe walls. Fitting the awning isn’t difficult, but is easier if you have a small folding stool or stepladder. Like most awnings it’s held up by poles and pegs, so you need to be on reasonably soft ground. The tent-stowing arrangement means there’s no chance of a wet tent soaking the bed, because it’s safely stowed inside its storage net on the underside of the lid. Our testers loved the bed comfort and the night-time view of stars through the roof hatch. Getting in and out of the sack was a little tricky, but the pay-off was excellent under-bed storage space. The Tvan has a roll-out galley with two-burner stove. The test trailer came with a deep-cycle battery, but without an optional floor-mounted fridge. Our test crew used an in-vehicle fridge. The Tanami came with an electric pressure pump over the sink and an additional manual pump on the side of the body. The latter was ideal for a quick hand wash after packing up and for topping water bottles without the need to open the galley. The standard water tank holds 70 litres and a second tank is optional. The only kitchen change the testers wanted to make was a clip-on stove frame, rather than the screw-on attachment, to make cleaning quicker and easier. 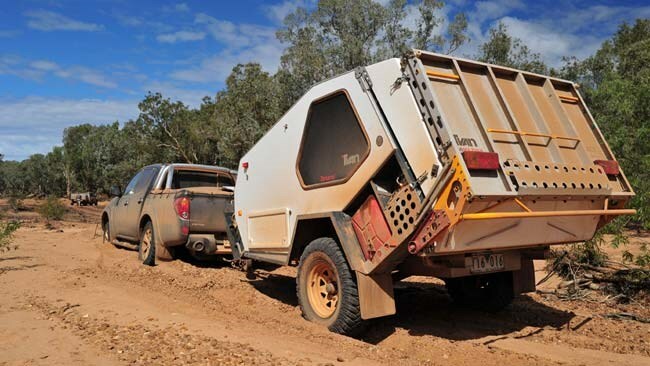 The Tvan Tanami sits on Track Trailer’s military-design, cross-over swing-axle, independent suspension, with coil springs and top-quality Koni dampers. Unlike many independent trailer suspensions, this asymmetric link design has optimum roll-over resistance, and even high-speed manoeuvres failed to provoke any sway in the trailer. The wheel ends were fitted with electric, off-road drum brakes. With a loaded axle weight of 1.1 tonnes the Tvan was the second lightest camper on test but, with three full jerry cans located on the drawbar, had a heavy ball weight of 132kg. It was towed by a Mitsubishi Triton and that amount of weight on the towbar gave the standard-suspension Triton a rearward droop. Moving the uncoupled Tvan around on its jockey wheel was a literal pain, unless the jerry cans were removed. Track Trailer makes the Sport model, without a jerry-can storage rack and a longer drawbar, with a claimed ball weight of only 60kg. Given the Tvan’s super-stable suspension design, that should be enough. Tvans come with a DO35 mechanical coupling that we found easier to connect than the poly blocks used on all the other trailers, but we had trouble every time we tried to uncouple it. Our test conditions involved a sequence of soaking rain, mud spray, creek crossings and bulldust and the DO35 didn’t like any of them. The coupling jammed in place and needed the persuasion of ‘The Murray’ (a 110kg crew member) whenever we had to separate trailer from vehicle. We read the coupling instructions carefully and followed them to the letter. We also performed several cleaning and greasing operations on the coupling to no avail. The Tvan proved to be a true go-almost-anywhere camper trailer that was stable to tow in all conditions, quick to set up and very easy to live in and around. If we bought one, we’d opt for no jerry can stowage on the drawbar and a different coupling.